PESHTIGO! MOTIVATED Seller will look at all REASONABLE offers! Here is a 3 bd 2 bath w/2 car attached garage w/ another 2+ car garage with its own seperate well . All surrounded by 22 acres of woods in PESHTIGO hugged all around by the PESHTIGO River! 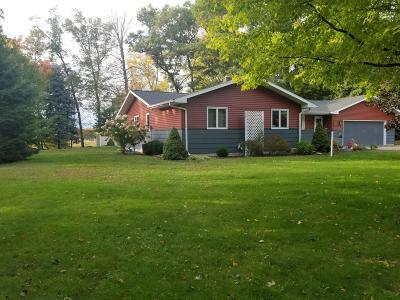 Home features open concept kitchen with custom counters/cabinets, security system, full basement with poured walls, conventional septic, 4 season room with fireplace and a huge beauiful landscaped perinial yard with a lawn sprinkler system. New roof is 4 yrs old as well as the new siding. Plenty of deer, bear, turkey and ducks. Outdoors person can hunt right on the property or go kayaking, boating or fishing right from the shore. Recent survey was done. River frontage is over a mile! (see map). This is A MUST SEE! Call today !